The struggle in motivating your team is that there are so many different ways to motivate them. Every person on your team is unique. Each one has a unique way they are motivated. The challenge for you is to discover how your team members are motivated. But once you discover what motivates others, you will be onto something. While everyone is unique in what motivates them, there are common themes you will find as you try to motivate others. 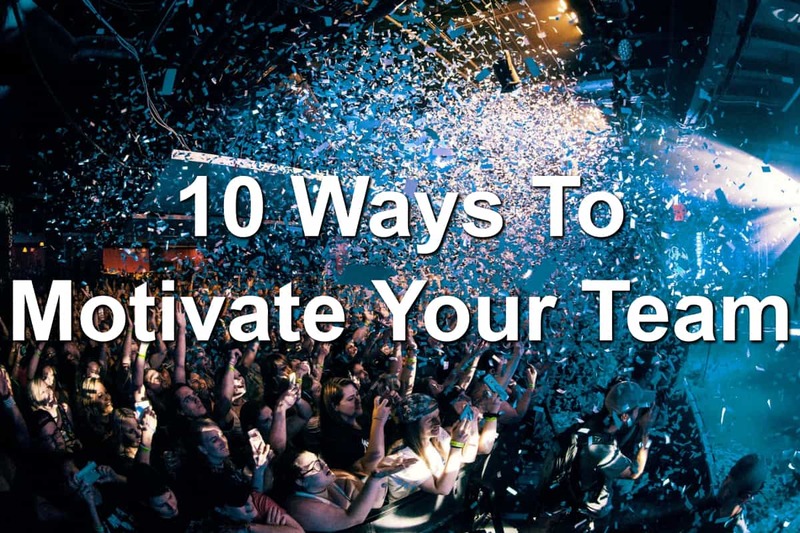 Below, you will see 10 ways to motivate your team. You will often hear money isn’t the main factor in people enjoying their work or being motivated. I will tell you this is true. However, you can’t discount the motivation a monetary reward will bring. Your team is looking to make a difference. They’re also looking to take care of their family. Without fair pay and fair rewards, they will struggle with this. When you begin to reward your team financially, they will take notice. They will be grateful. And they will be motivated. Remember, money isn’t everything. The motivation your team will receive from monetary compensation will go away. However, people can be motivated through monetary compensation. Who doesn’t love a great party? The organization I’m currently working at knows this is a great way to motivate their staff. We hold regular parties or employee events where team members come together and have fun. Whether the special event is a Christmas party, a party at the local trampoline park, or another way to celebrate, find a way to get your team members together and having fun with one another. Your team members have a desire to be recognized and praised. They may not come out and say this specifically but they crave praise. Your team wants to know you see the hard work they’re putting in. And it’s easy for you to recognize the work. You don’t have to go big or go home here. You can simply recognize the hard work they’re doing by specifically praising the actions they’re taking. Watch what they’re doing. Then tell them you noticed what you did and you’re proud of them. One of the greatest rewards you can give your team members is an extra day off for a job well done. When someone on your team goes above and beyond the call of duty, offer them a paid day off. You’ll be shocked how thrilled they’ll be with the news they can take an extra day off. They may spend their free day by going for an afternoon run, taking their boy to a minor league baseball game, or surprising their spouse by meeting them for lunch. Time off can be a huge motivator for your team. Try it out! The amount of time you spend with your team is more than you spend with your family. It’s also more than they spend with their family. With as much time as you spend with your team, you begin to learn about their hobbies and desires. This knowledge gives you an advantage in motivating our team. You know what they’re working for. You can motivate your team by giving unique gifts to each team member. As you discover what they enjoy, create a list you can consult when you want to do something special. Get a commissioned piece of art from their favorite artist, give them tickets to the Detroit Lions football game, or pick up a gift for their dog. Your thoughtfulness will go a long way in motivating them. Cultures are an important part of any organization. They can make it a great place to work or hell on earth. As a leader, you can create the culture you desire and one that is great to work for. But you have to be intentionally in creating a great work culture. Culture includes a lot of different things. The attitudes of the people you hire. The compensation packages you offer. Or the way you interact with your staff. All of these things impact culture and can be changed. Work towards creating a culture that empowers and motivates your team. Growing your people can be a huge motivation to those on your team. They see you believe in them and care about their careers. By investing in coursework, books, or audio classes you can help your people go to the next level. You will also motivate them. Be someone who pours into their teams. Business practice has taken away the humanity from many of their leaders. Leaders want to make everything about business and results. But leading is a human business. People don’t want a leader who is always condescending and negative. These types of leaders demotivate their teams rather than motivate them. Turn it around and become a kind leader. Show understand and compassion while being firm in seeing results. This isn’t an either or type of situation. You can lead with kindness. You can also motivate your team by bringing gamification to the office. If you don’t know what gamification is, it is the process of applying elements of video games to everyday activities. There are many ways you can do this. One way to gamify the office could be to create a “level up” chart where salespeople are given a new “title” based on the amount of sales calls they make. Make things fun and you might see motivation increase. Last but not least, your example can be a motivator. Your team is watching how you perform and what you do throughout the day. If you’re negative, downtrodden, or bored… Don’t expect your team to be any different. However, if you come to work energetic and ready to work, your team will be inspired by your example. Your example will motivate them. Question: What are some other ways you motivate your team? Let me know in the comment section below.